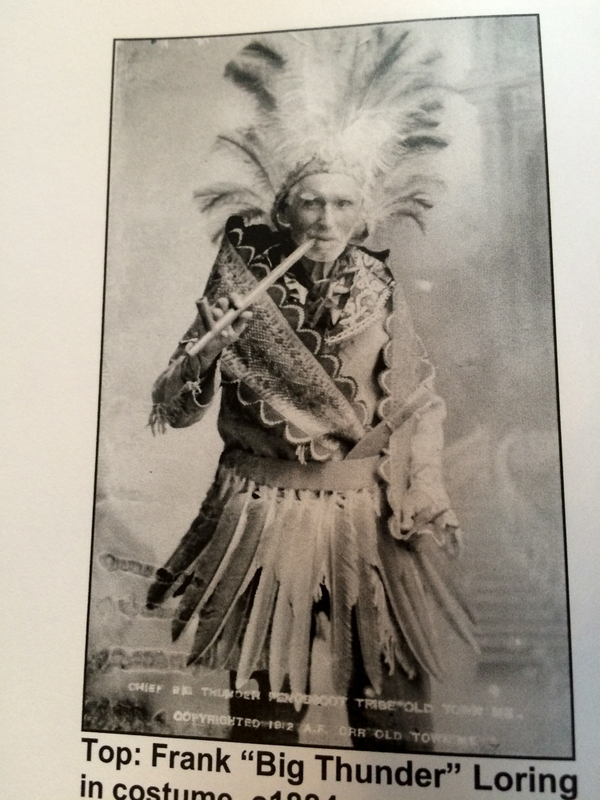 George Neptune, Museum Educator, Abbe Museum, Bar Harbor, Maine, and member of the Passamaquoddy tribe. 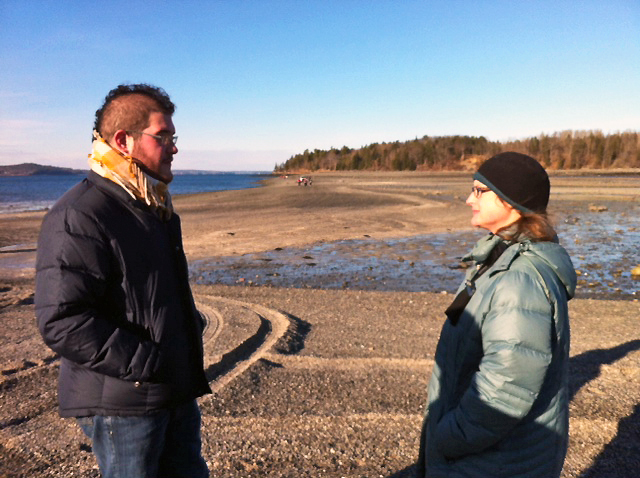 Dr. Jane Disney, President, Frenchman Bay Partners and Senior Staff Scientist, Mount Desert Island Biological Laboratory, both in Salisbury Cove, Maine. 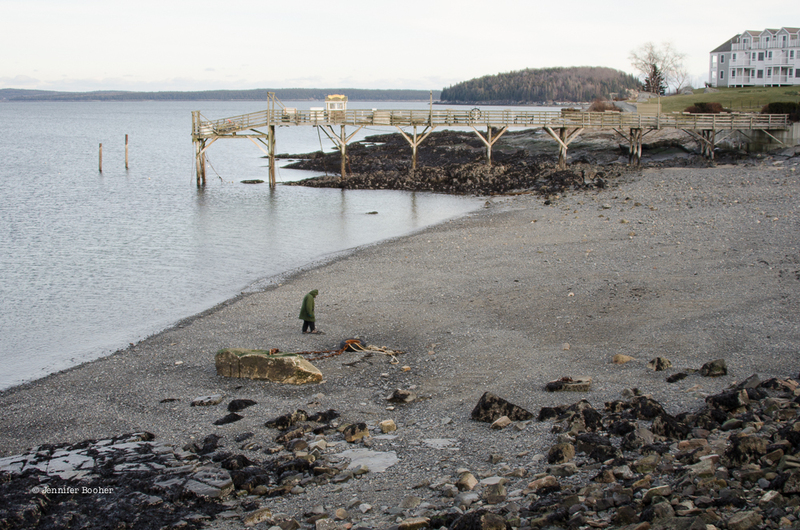 The Bar is a strip of land exposed at low tide that connects the town of Bar Harbor to a smaller island called Bar Island. 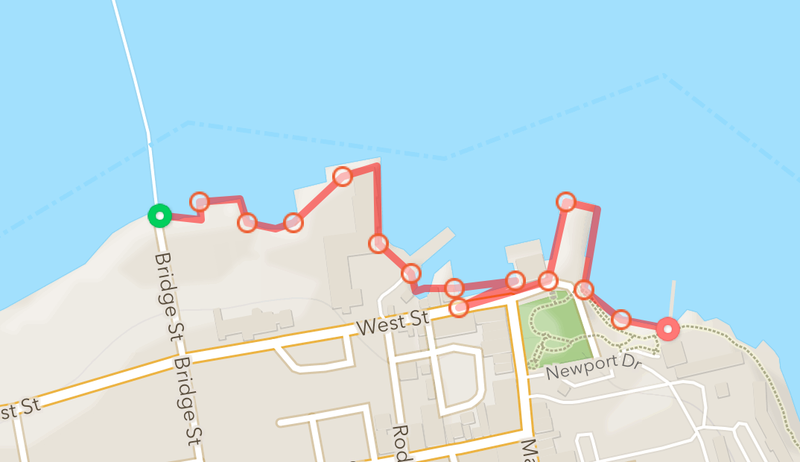 I kicked off the Coast Walk at the Bar because 1) The town took its name from the the Bar, 2) it’s a very visible local landmark with a small footprint, so when you say, “I started at the Bar,” most people on the island can visualize that location within 10 feet, and 3) I knew there had been Wabanaki villages near it and it seemed appropriate to begin with the island’s first known human inhabitants. 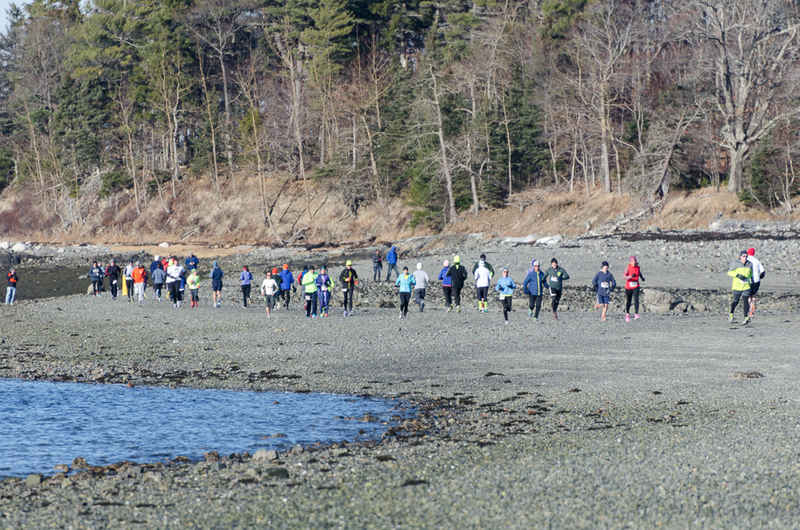 The Bar is one of the town’s more popular open spaces – there’s always a dog walker or a jogger down there (at low tide) – and in fact as we were gathering, the 5K Resolution Run came dashing across. 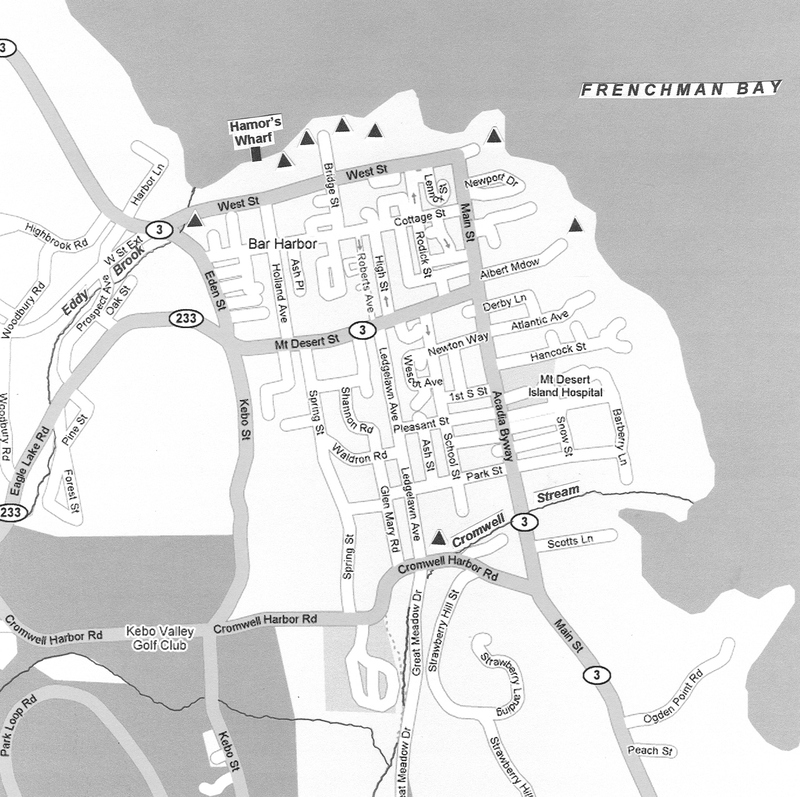 I should note that I’m presuming my readers have some familiarity with Mount Desert Island, so if you are not from the island, please don’t hesitate to ask questions in the comments area at the end of the post. 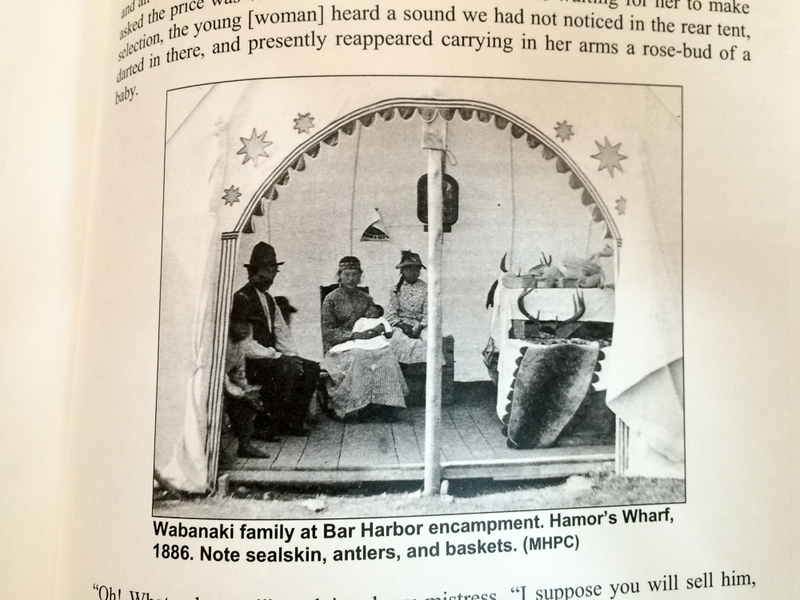 Map courtesy of the Abbe Museum: the triangles represent Wabanaki encampments. 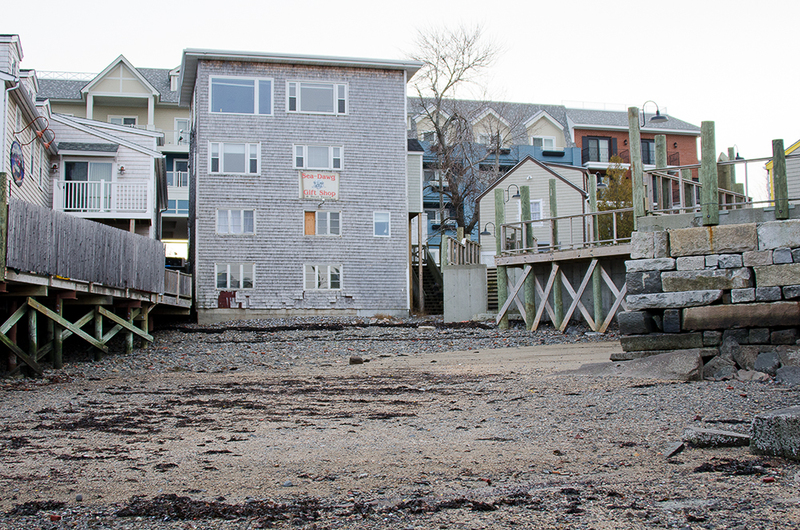 Jane: This is one of our Healthy Beaches – I’ve been monitoring this beach since the beginnings of the program in the 90s. me (Jenn): And what have you found? Jane: It’s pretty good. Every now and again we have a spike, and people leave dog waste. Jenn: What are you monitoring for here? Jane: Bacteria. Because there’s a lot of water contact here with people launching and day cares with kids at water’s edge. Jenn: So not for things like gasoline and fuels? Jane: No, no, just bacteria. … We were hired to do the cruise monitoring this summer … . For the most part the ships are doing things right. We have more problems with the small fishing vessels than with the big cruise ships. Jenn: Well the cruise ships have more resources, too, for processing. Jane: Yeah, I think there’s been talk of putting in a pump-out station, and I don’t know where that is, in the works, but maybe our report will help stimulate that conversation. Jenn: So do you find spikes in the summertime? Jane: Yes, sometimes after heavy rain. We had a dry spell and then we got that big rain, and a lot of runoff, and we … picked up a lot of bacteria out around one of the big cruise ships, but I think it was coming down Cromwell Brook. But there’s a lot of bacteria that ends up out in that anchorage, out of Cromwell Brook, so that’s a conversation to have in town. 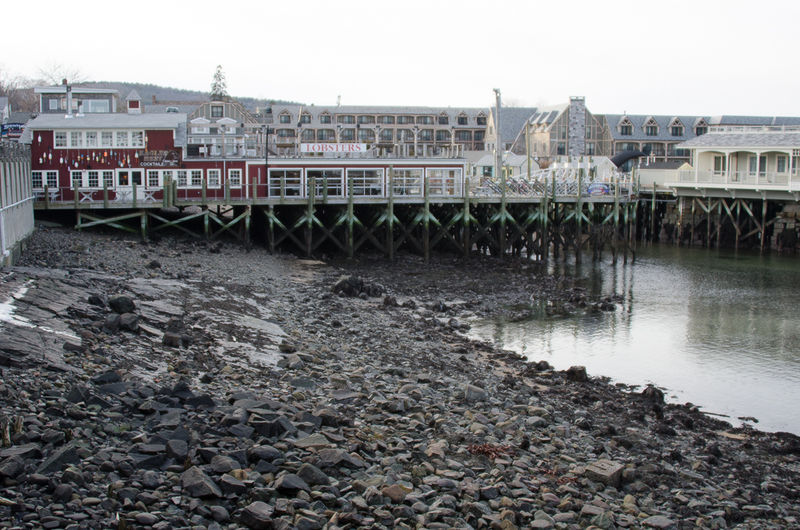 [Looking at the iron pipe emptying onto the beach near the Bar Harbor Inn pier:] But see, this is stormwater runoff, and I’ve long said to the Town, this isn’t where you want to funnel stormwater runoff. Sometimes I do get high bacteria over here. But then I have a lot of boats: I don’t know if it’s the boats, or the runoff – this [end] isn’t always out of the water, so I can’t always sample right out of the pipe. 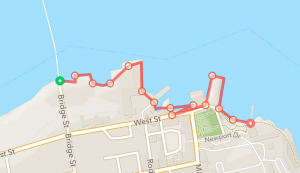 Commercial waterfront, heavily built up with wharves and sea walls. 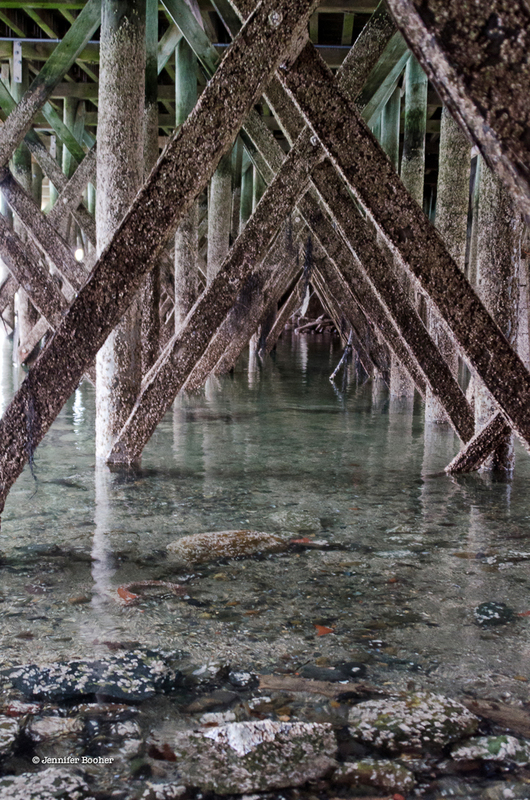 Remnant beaches tucked between structures are mostly gravel with some larger stones. 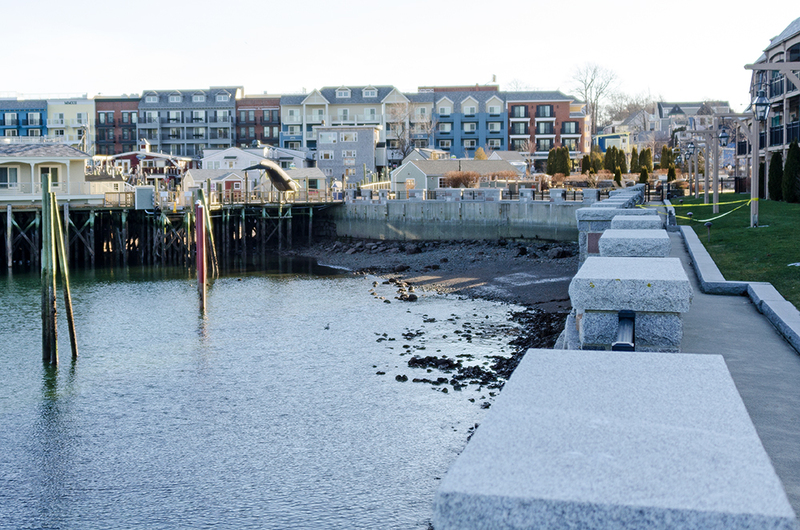 Shattered ledge appears between Stewman’s wharf and the Town Pier, and again on the the Town Beach. Not much live wildlife visible: 2 female Mallards, a few Herring Gulls, 4 or 5 pigeons huddled under the docks, and thousands of periwinkle and barnacles. Dead wildlife included shells of clams, dog whelks, a moon snail, Green Crabs, and the skull of an Eider Duck, all of which were frozen to the beach. 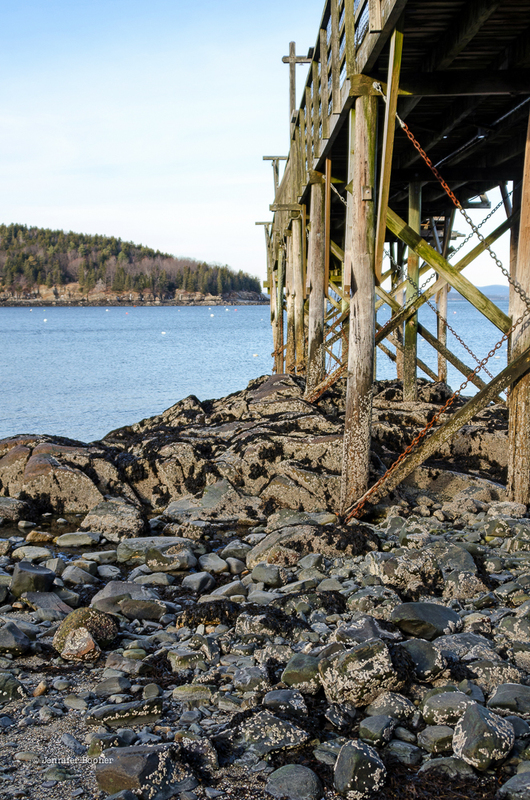 And that’s all the adventure for today – on the next Coast Walk, Debbie Dyer of the Bar Harbor Historical Society will tell us about the owners of the original cottages along the Shore Path. Great first blog! 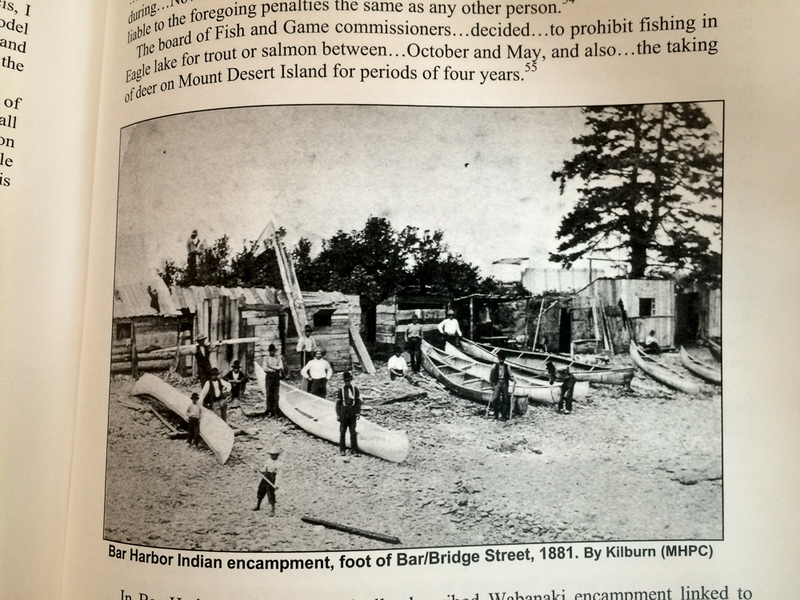 On old Bar Harbor maps (one that we have in our house), our lot is listed as an Indian encampment. Whenever we do any digging, we are always looking for evidence of the encampment. No luck yet but I’m sure there is something out there. 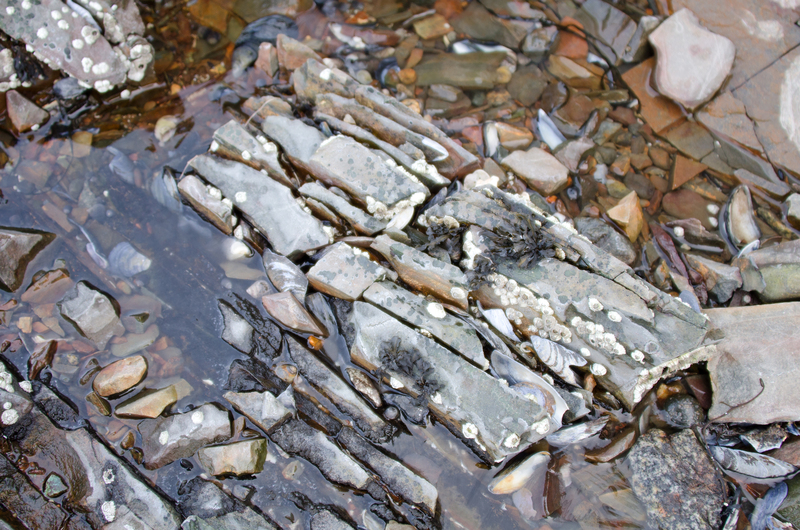 I found a great triangular shaped rock down near the sand bar the other day which looks to be too perfect to be natural. I hope you do find something! Maybe you could bring the rock over to the Abbe and ask if it’s an artifact?